"These are the best I've had! Red potato skins are full of flavor!" Bring a large pot of lightly salted water to a boil. Add potatoes, and cook until tender but still firm, about 10 minutes. Drain, and place in a large bowl. Combine potatoes with butter, milk, sour cream, salt, and pepper. Mash together until smooth and creamy. Kids love it! Quick and easy to make. Peels are nutritious. Very important to boil the water before you add the potatos or it will be too mushy. I dont agree with BTRACY02. I love when people add additions to the reviews, It gives me other ideas. THANK YOU!! These mashed potatoes were great!! Absolutely delicious! Didn't change a thing. 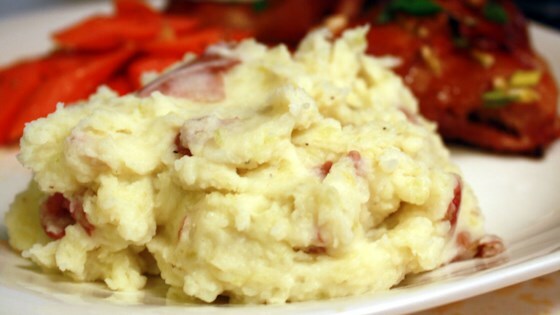 No need to add garlic unless you want Garlic Red Mashed Potatoes.